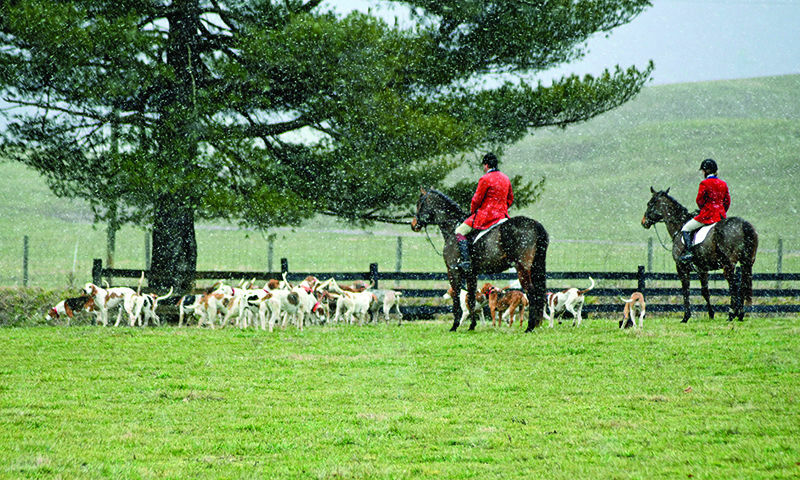 Rappahannock Master of Foxhounds and Huntsman Michael Brown and Whipper-in Virginia Rushing contemplate recasting hounds as a gentle snow begins to fall. 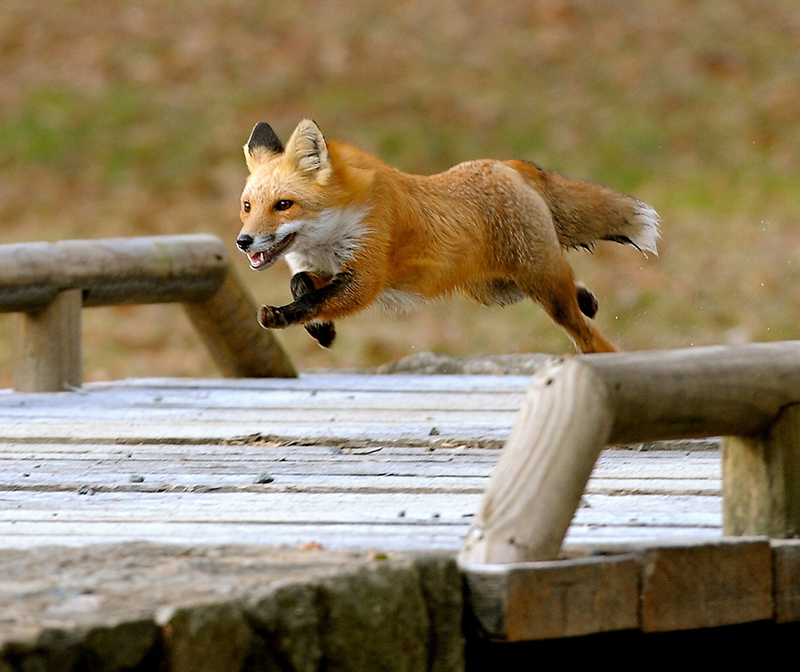 Fox hunting is an art, a science, a sport, and for those who do it, an obsession. At least it is for me. Its arcane traditions and picturesque attire, together with a language all its own, make it a curious pastime to the uninitiated, although people around the world have been doing it pretty much the same way for the past 500 years. 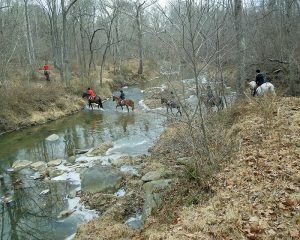 A classic winter foxhunting scene: no snow on the frozen ground, but ice gathering in the river. 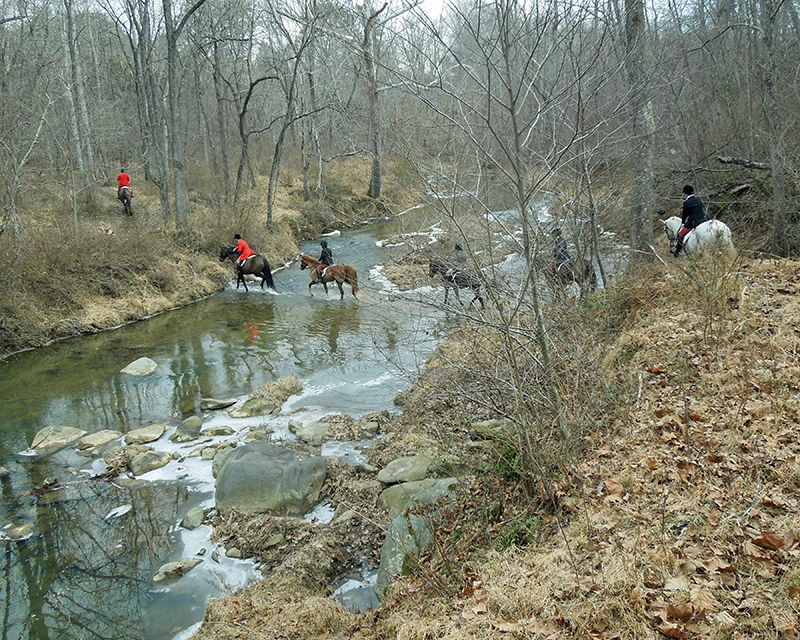 The sport came to North America with the English and Irish colonists, many of whom brought their foxhounds with them, and by the mid-1700s, fox hunting flourished along the Atlantic coast from Canada to Georgia, with Virginia, Maryland, and, to some extent, Pennsylvania at the epicenter. No less a personage than George Washington was a passionate adherent. He bred and raised his own packs of foxhounds all his life, suspending his hunting only during the American Revolution. In fact, the youthful Washington and his best friend, William Fairfax, were known to go on days-long fox hunting jaunts in the Virginia Piedmont while ostensibly surveying the vast landholdings of William’s cousin, Lord Thomas Fairfax. Thomas was as enthusiastic about fox hunting as young George and William, and he established the first organized fox hunt in the New World. The primary quarry in those days was the gray fox. Although both gray and red foxes are native to North America, reds seemed to prefer the colder climates and were found mostly along the Canadian border and rarely south of New Jersey. The story has it that around 1730, a group of Maryland fox hunters, bored with the grays’ relatively short runs, had a boatload of reds sent over from England to see if hunting would improve. To their delight, it did. It took only a few years for the reds to propagate and to overtake grays as the quarry of choice. Today, grays are rarely seen in Virginia, but when they are, fox hunters rejoice. The Virginia Piedmont has a strong claim to the development of the sport in America. 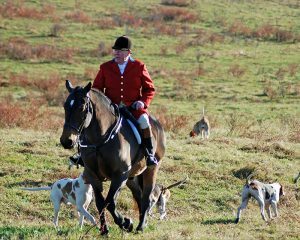 The area is home to the governing body of fox hunting, the Masters of Foxhounds Association of North America, which is in the process of moving its headquarters from Millwood to Middleburg. By Gus Edwards, Photography by D & G Reardon. Read the rest of the article in the September/October issue of the Piedmont Virginian, on the stands now. Don’t miss an issue! Print and digital subscriptions available….subscribe now!